We live and work in the city that proudly carries its City of Peace and Justice title, but on the flip side it is a city with most sitting jobs. Have you ever wondered how many hours a day you spend sitting and does sitting have a negative impact on your health and well-being, short-term and long term? There is more and more compelling evidence that sedentary lifestyle is contrary to our biological needs and is destructive to our overall well-being. The human body is designed to be mobile, not sedentary. In fact, we sit an average of 9.3 hours a day, more than we spend sleeping. Scientists believe that anyone sitting more than 6 hours a day is at a heighten risk of developing chronic diseases and this much sitting may be as bad as smoking a pack of cigarettes daily. So while that 1-hour jog is great for you, it may still not undo the 8 hours sitting at your desk. So what are the facts? Latest research? Our Experience? What can we do? 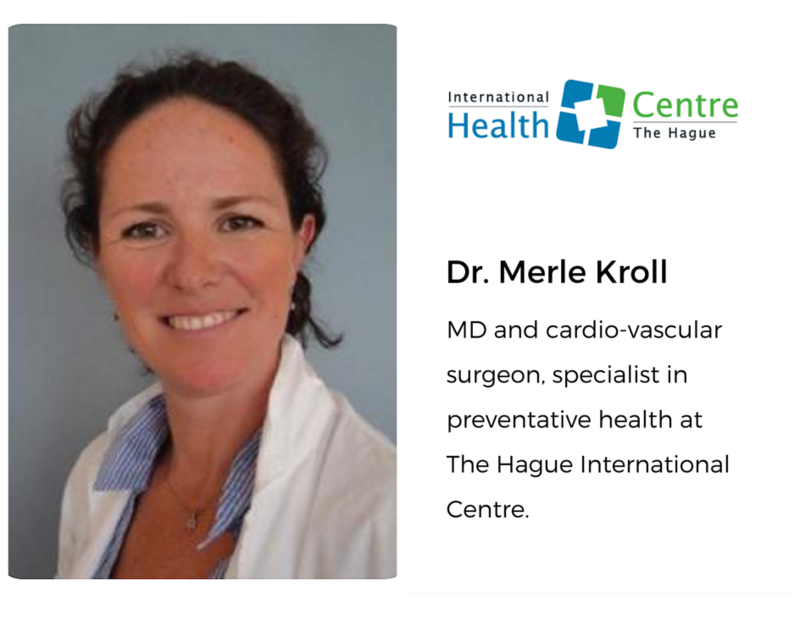 Dr. Merle Kroll will share with us her experience from her practice at The Hague Health International Centre where she is seeing a lot patients that work for international organisations in the city. Their work involves prolonged periods of sitting. She will highlight most common pathologies and suggest ways of introducing small changes into your daily routine that will help you overcome the negativity of sitting. She will also dwell on importance of a balanced diet. 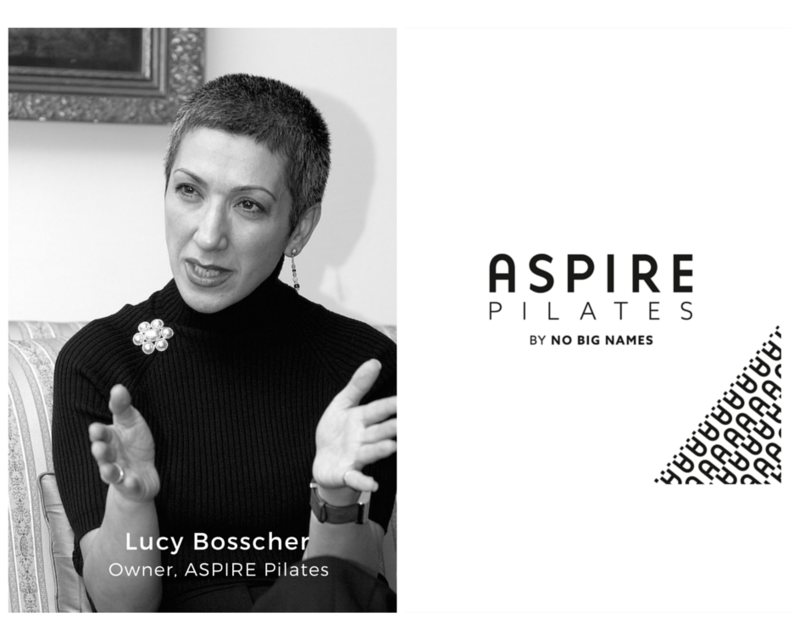 Lucy Bosscher will explain the unique nature of Pilates system of body conditioning, and the approach and philosophy used at Aspire Pilates, where everything starts with awareness. Pilates system is a simple and highly effective tool to reverse negative impact of sitting that can be adapted to all levels of ability. By emphasizing proper breathing, correct spinal and pelvic alignment, and concentration on smooth, flowing movement, Pilates brings you in tune with your body. You learn how to master control of its movement. You and your body, you become a power couple. Would you say No to that? Bring your friends, spread the word. Let’s make this an informative, stimulating and inspiring evening! Contact us to register for this FREE event. You may also email us directly at Office@NoBigNames.com to reserve your spot. Learn, discuss and exchange; gain insights; meet new people; get stimulated and inspired. 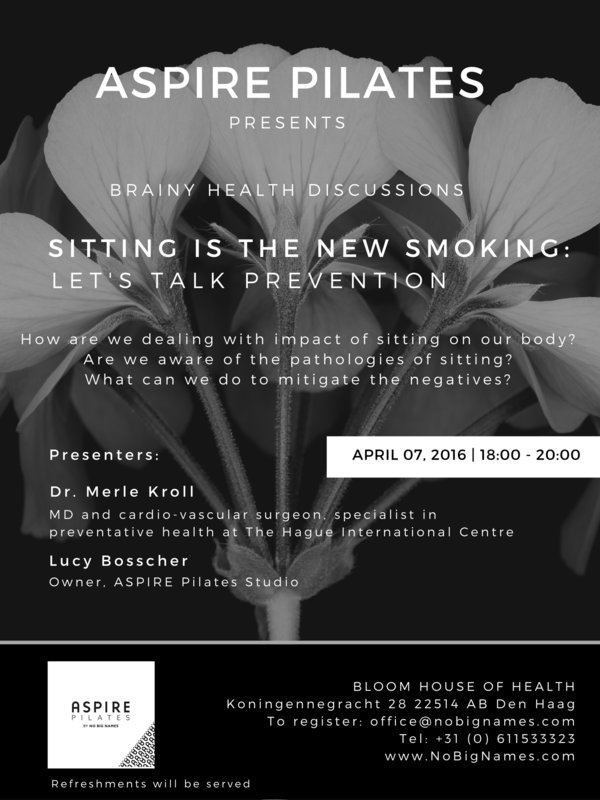 Hope to see you on Thursday, April 7 at 18.00. 1. How did you discover Pilates? I was introduced to Pilates through a book my father gave me for Christmas a few years ago. I have been an avid runner and did not like going to the gym, so he thought that Pilates would complement the exercises I was (not) doing. I read the first chapters of the book and was fascinated. I tried to practice the exercises from the book whenever I travelled for work in remote areas of Africa, in my small hotel room. However, I never went further than those initial chapters and I now realise that I did not really know what I was doing. 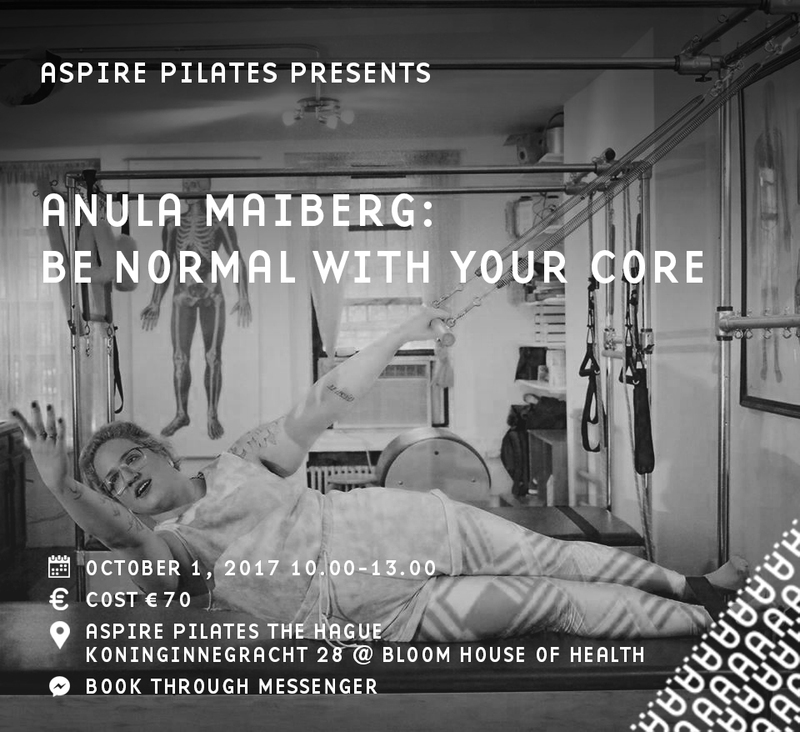 It is only when I met Lucy Bosscher of the Aspire Pilates Studio in The Hague and did an introduction course, that I came to understand what Pilates is and how much I could benefit from it, particularly for my running and triathlon competitions: to keep injury-free and to enhance my performance. I have been taking Pilates classes for three years, both private, using all sorts of equipment, and group classes. I love both types of classes, but consider private sessions a real treat and try to do them at least once a week. 3. What was your initial experience of Pilates and how has it evolved over time? I loved Pilates from the very beginning. It was quite a revelation to discover its principles, the breathing and the control you must have over each muscle of your body. With time, I got to understand better what movements are required for a specific exercise and what I should pay attention to. But even after three years I keep being surprised in discovering new exercises and all variations that go with it. 4. How have you benefited from Pilates? Pilates helps me improve my running style, keeps me stable on the bicycle and has greatly enhanced my stroke in swimming. I keep training and competing, reaching better personal results and sometimes even a higher step of the podium but, above all, pilates has kept me injury free. 5. What is your favourite exercise and your favourite piece of equipment? the “magician”, which I have just discovered. As for my favourite piece of equipment, without any doubt, it is the chair, so simple, and yet so versatile. 6. What has Pilates become for you? Pilates is a privileged moment dedicated to my body and my mind. After each class, I feel so good! I feel relaxed, I feel confident. 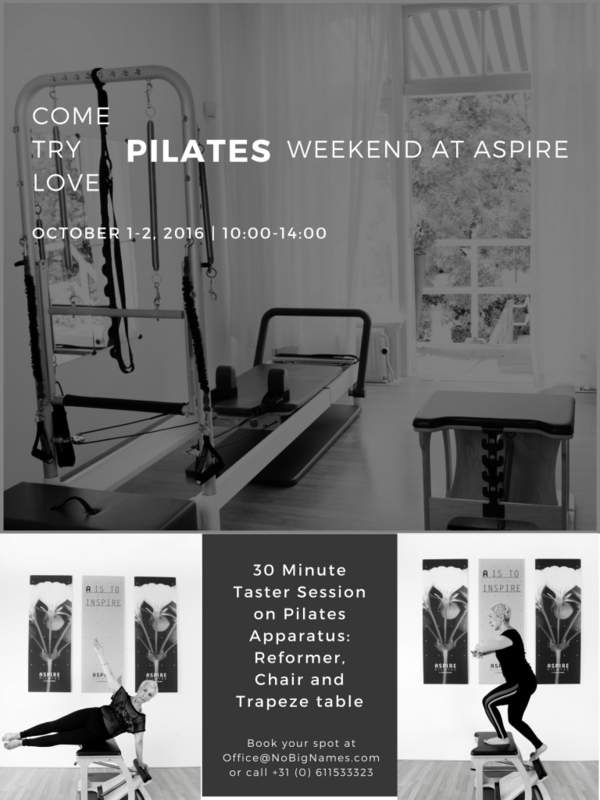 I always leave Aspire Pilates with renewed energy. Pilates is a great exercise system; it conditions your body and at the same time refreshes your mind. I never get bored with Pilates!